Enjoy Big Bear Lake's immense beauty in a number of outdoor activities. Hiking, biking, and horseback riding are perfect ways to discover the miles of trails around the lake. Fishermen can cast lines throughout the lake with it's additional 9'+ of water added this winter. Golfers can take advantage of pristine, scenic, and challenging courses. Isn't a spring getaway in the cards for you? Our cabin is in the middle of it all! Keep the stress away in the Hot Tub on covered deck while enjoying Lake & Mountain views. Big Bear Lake is at it's highest level since 2014 -- with 9+ feet of water added so far this year! We're right across the street from the lake. ​Hurry and contact owner to take advantage of our seasonal BARGAINS! ​Spring 2+1 SPECIAL: Stay 2 nights and get an additional night for the low, low price of FREE! (The least expensive night will be designated as the free night.). Valid 03/29/2019 thru 06/13/2019. Spring 7 SPECIAL: Stay 7 consecutive nights at only $99/night. Valid 03/29/2019 thru 06/13/2019. ​Restrictions: Not valid during holiday periods except where noted or with other special offerings or promotions. You’ll find a mountain setting complete with luxurious new floors and carpet throughout, and a large sectional couch adorned with rustic pillows. Prepare your breakfast using the kitchen’s new counter tops and backsplash. Plus the hall bath has a new deep soaking tub and Travertine tiled shower. And the cabin interior is camera free. The Great Room features wood beams across the vaulted pine-knot ceiling and a large, comfy sectional sofa in front of the wood burning fireplace - maybe roast marshmallows tonight? This room also includes an internet-ready cable Smart TV and Blu-ray/DVD player with a 100+ movie library, AC protocol high speed internet wi-fi, fun board games and jig-saw puzzles. We have received great reviews on our kitchen which offers new appliances: dishwasher, range, microwave, toaster oven, coffee maker, and blender and is also fully stocked with new cookware, utensils, and dishes to make your stay feel like a home away from home – perfect for cook-outs and large family dinners! Through the Kitchen Door, on the side deck, your catch of the day or favorite food sizzles on the grill while you enjoy the lake, mountains and tall pines – there is nothing like the fresh smell of pine trees and listening to the breeze through the pines. The side deck leads to the spacious back yard that invites lots of fun play including sledding and building snow-people when nature brings in her snow. After a full day of fun, the spa sits on the covered deck with lake and mountain views ready to bubble your aches from the day away. Or, relax on the wood rockers or wood slider on the front deck and watch the colors of the sunset at play on the lake while the ducks chatter about their day’s activities. Life, as you had known it only minutes earlier, looks and feels quite spectacularly different. In the Great Room enjoy the roaring fire in the fireplace to roast marshmallows then before retiring to bed, turn the electric blankets to preheat making your bed cozy and ready to take you to your sugar plum dreams. The Master Bedroom with King Bed has an adjoining bath, walk in closet, and sliding glass door to the deck and views of the lake and mountains. It also has a 27' TV with cable and DVD player. The kids’ favorite is the bunk room with a bunk bed - twin upper and double lower, a separate twin bed, and a TV with DVD player. The Queen Bedroom has the spacious Queen Bed and wall to wall closet. 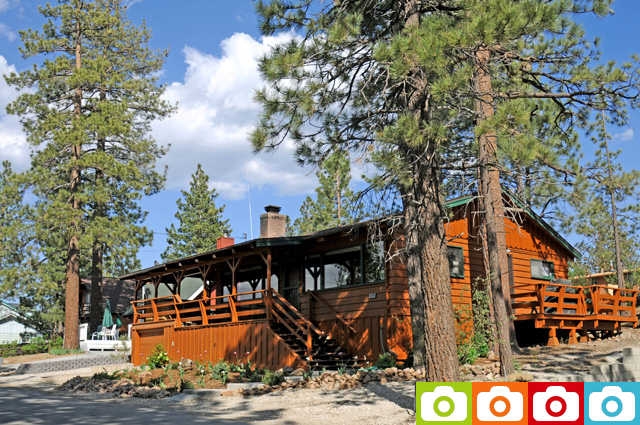 The cabin is a City of Big Bear Lake approved Transient Private Home Rental (TPHR). Calendar updated within past week. Sharon's home is located in Big Bear Lake, California, United States right across from the lake and close to The Village. About the owner: We fell in love with Big Bear Lake years ago and were very excited when we came across this property - we could not live without it. While it is centrally located - minutes to everything, it is located on a quiet street away from the hussle of the world. Our favorite time of the day is sitting on the deck watching the colors of the sunset play on the lake while listening to the ducks chatter about their day's activities. And as we sit there, we notice that our cares of the day have slipped away. CAMERAS: We have cameras that monitor the exterior-ONLY of our cabin. CHECK-IN is 3:00 PM local time. CHECK-OUT is 11:00 AM local time. *Please note that during the Christmas & New Year's Holiday periods, check-in time is 4:00 PM, and check-out time is 10:00 AM. MINIMUM AGE: You must be at least 21 years of age to rent 4 Seasons Of Fun vacation cabin. Additionally, members of a non-family party must each be at least 21 years of age. NOISE: No parties/events. Respect neighborhood tranquility. OCCUPANCY: Maximum occupancy is 8 people. PARKING: Maximum off-street parking for up to 4 cars or 3 cars and a boat trailer. PETs: Pets are not allowed on property. SMOKING: No smoking inside the cabin. Ash buckets are provided on the front and side decks. ​Cancellation or date changes made less than 15 days prior to arrival will result in a loss of all payments made or due to be made. If we are unable to re-rent the property after your cancellation, you will be entitled to a refund of only the cleaning fee. However, if we are able to re-rent the property after your cancellation for any portion of your cancelled stay dates, you will be entitled to a refund of your cleaning fee and the portion of the rental amount we are able to recover with the re-renting of the property for the same dates.